Peter uses a very Jewish form of prayer: “Blessed be God.” The object of his praise is the One who is the Father of our Lord Jesus, in whom are fulfilled the promises of God to the patriarchs and prophets of the Old Testament. Jesus is King and Messiah for the sake of both Jewish and Gentile believers, and Peter, addressing both groups without distinction, calls Him our Lord. In Jesus the Messiah, God has displayed His abundant mercy. Though writing in Greek, Peter would have most likely had the Hebrew word hesed in mind, the word used so often in the Old Testament for the faithful love and mercy God promised to show His covenant people. 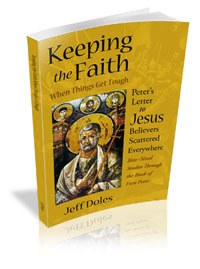 Peter then details some of the ways this divine love and mercy are revealed to us in the Lord Jesus. Through the new birth. God has begotten us again through faith in the Lord Jesus, so that we would have the right to become children of God (John 1:12). This new birth is from above, by the Spirit of God (John 3:3-6). We are born again of the Sprit but also of the incorruptible seed of the Word of God (1 Peter 1:23). God, who called the world into existence by His Word, gives us new birth by that same Word. Through a living hope. The biblical use of “hope” does not refer to wishful thinking or to things that are tentative. It speaks of a positive expectation, a joyful anticipation. In Jesus the Messiah, we have a living hope. It is the joyful anticipation of divine life and fellowship without end. In Ephesians, Paul prayed that God would give us wisdom and revelation by the Holy Spirit so that we would be able to know what this hope is all about (Ephesians 1:17-18). Through the resurrection of Jesus the Messiah from the dead. Here is the direct reason we have a living anticipation: Jesus has been raised from the dead. Paul calls Him “the firstborn from the dead” (Colossians 1:18) and spends a great deal of time in 1 Corinthians 15 talking about what that means for us who believe in Him. The Jews expected that there would be a resurrection of the just at the end of the age, but in the resurrection of Jesus, the end of the age has broken into the midst of this present age as the firstfruits, the surety of what is to come for all who trust in Him. Through an inheritance that is indestructible and undefiled. Inheritance speaks of family and fatherhood. Through the new birth, we have God as our Father and become part of His family, heirs of God and joint heirs with Christ (Romans 8:17). In Adam, we inherited death and moral corruption (Romans 5). In Jesus the Messiah, we inherit life and purity. In his second letter, Peter says that God has given us “exceedingly great and precious promises, that through these you may be partakers of the divine nature, having escaped the corruption that is in the world through lust” (2 Peter 1:4). This inheritance will not fade away, as flowers do, but is carefully guarded for us in heaven. It is of heaven but it is not just for heaven, for in the resurrection, our life will be on earth, and heaven and earth will finally be joined together as one (Revelation 21). Through the coming revelation of salvation. This is the ultimate unveiling of what God is doing in us. We enter into the family by faith in the Lord Jesus, and God is currently maturing the life of Jesus in us through work of the Holy Spirit (see Transformed by the Holy Spirit). One day it shall all be revealed. John said, “Beloved, now we are children of God; and it has not yet been revealed what we shall be, but we know that when He is revealed, we shall be like Him, for we shall see Him as He is. And everyone who has this hope in Him purifies himself, just as He is pure” (1 John 3:2).